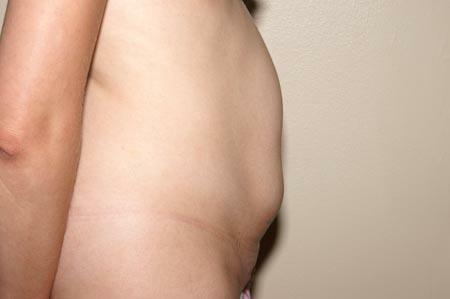 The abdominoplasty before and after photos below are of Dr. Wisnicki’s patients. This patient is a 34 year old woman who desired improvement of her abdominal contour. She had 2 childbirths and a C-section. She underwent abdominoplasty (tummy tuck) in West Palm Beach by Dr. Wisnicki. This 46 year old mother of one had a tummy tuck together with liposuction. The procedure included tightening of the underlying muscular fascia. She was very pleased with the improvement. This 38 year old female had multiple pregnancies and had an abdominoplasty together with liposuction of the waist and outer thighs. The follow-up photographs were obtained 2 years later. She had a breast augmentation by Dr. Wisnicki 10 years prior to these photographs. This 41 year old had 2 C-sections and had an abdominoplasty and tumescent liposuction. She was pleased with the flattening of her tummy evidenced in the photographs taken one year after the procedure. Abdominoplasty, liposuction of the hips, and bilateral augmentation mammoplasty performed by Dr. Wisnicki in West Palm Beach, Florida. Abdominoplasty and breast augmentation in a 37 year old female. This patient has had multiple pregnancies with C-sections and desired improvement of her abdominal wall as well as breast enhancement. She underwent breast enlargement in conjunction with her tummy tuck. Abdominoplasty and breast augmentation performed together by Dr. Wisnicki. The follow-up photos are 3 years later.